If you already have or are willing to buy a 5 pound slide hammer, you can make your own diesel prechamber removal tool. Slide hammer action will allow you to PULL it from the cylinder head once you have removed the collar nut and the glow plug ( a collar nut removal tool is required look below to learn more). Complete PDF instructions are included on how to remove and replace the pre chamber once you have welded this tool to your slide hammer (no instructions on how to weld it to the hammer as most slide hammers are different). If you don't know how to weld, take this threaded adapter and your slide hammer to a local welding shop and they can do it for you. 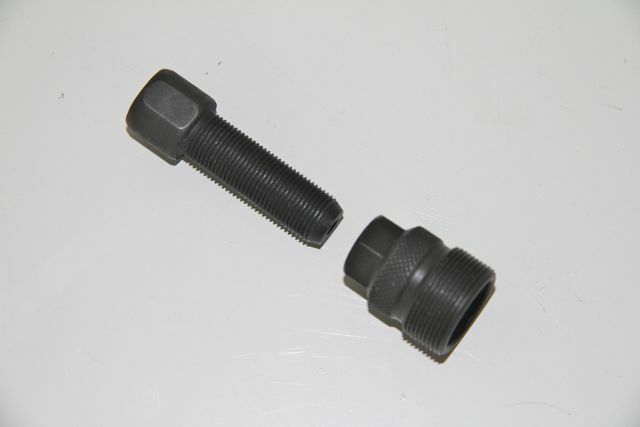 This threaded adapter comes in two parts as shown below. The larger piece has the very specail thread needed to get down into the prechamber. It will work on 170D 180D 190d, 200D 220D 240D 300D 300TD 300CD 300SD 190D and 300SLD from the early 1950's up to 1987. The longer piece threads into this larger piece. Both parts are made with high strength steel. You will need to weld one of your slide hammer threaded adapters to the top of this longer piece and you will be good to go.